You are looking at a new generation of custom cruisers. A breed that stands apart. Check out the incredible attention to detail. From front to back, the 2011 Yamaha Raider is loaded with “custom” inspired parts. Stretched out fork, fat rear tire, low seat and an aggressive, slammed riding position. The 2011 Raider features more black parts than the S version. The Yamaha Raider not only looks good… it offers an incredible riding experience too. If you want totally custom but would rather ride than wrench, have a look at the 2011 Yamaha Raider by Star Motorcycles. The 113 cubic inch fuel injected V-twin engine that powers it takes a back seat to no V-twin when it comes to power and reliability. And the rest of the chopper-inspired 2011 Yamaha Raider is pure Star, designed and engineered by the world’s best bike builders. Mechanical centrifugal decompression mechanism located in each of the exhaust camshafts, insures fast, easy starts. 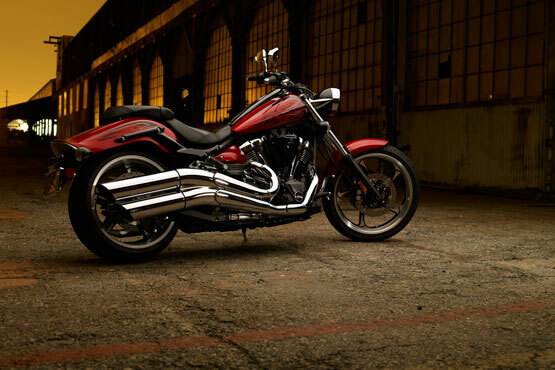 The crankshaft is a single pin design, providing that special V-twin sound and pulse feel. Optimized flywheel mass and “damper-less” crankshaft allows the rider to feel the directness of the engine’s power. Dual balancers reduce vibration for exceptional rider and passenger comfort. The balancers are positioned on either end of the crankshaft to reduce vibration and to minimize the size of the engine cases. The balancer is designed to reduce vibration while still allowing that classic V-twin pulse feel. Large-diameter pistons are both durable and lightweight. Yamaha’s exclusive “controlled forged construction” keeps the pistons light for faster response and to accommodate higher rpms with reduced vibration and less reciprocating mass. The pistons feature an Alumite coating to reduce friction. 3.5 litre dual inlet air filter box features one inlet at the front and one at the rear of the airbox for maximum breathing efficiency. This design not only maximizes air flow but also reduces weight and allows for a more open appearance at the steering head area. A viscous paper type air filter is used. Heavy duty 10 plate clutch is designed compliment engine power characteristics. This clutch is operated by a hydraulic master cylinder instead of a cable. The hydraulic clutch design is low maintenance, self adjusting and stylish too. High tech, cast aluminium double-cradle frame reduces weight, while balancing strength and rigidity. The engine is rigidly mounted in the frame for added rigidity. The critical head pipe area features box type construction for additional strength. The frame not only provides excellent handling characteristics but also compliments the beautiful flowing lines of the entire machine. The open area behind and below the steering head helps to enhance that “chopper inspired” styling image. The main front wire harness is hidden in the head pipe for a clean appearance. Lightweight C.F. die cast aluminium swingarm offers superb rigidity and ensures excellent stability and handling. The C.F. die casting process allows for beautiful shapes that are both strong and light. This swingarm is a fashion statement in aluminium and compliments the rest of the Raider eye catching styling. Link rear suspension features a spring preload adjustable single rear shock delivering outstanding ride comfort and precise handling. The Kayaba shock is horizontally positioned under the engine lowering the centre of gravity for great handling. The shock is hidden to provide that classic “hardtail” look. Rear wheel travel is 90mm (3.5″). Powerful dual 298mm floating front discs are squeezed by ultra rigid, 4-piston, monoblock calipers to provide sport-bike spec stopping power with great lever feel and feedback. Flangeless teardrop style main fuel tank offers 12 litres of capacity. There are no welds visible, providing that clean, custom look. Total fuel capacity is 15.9 litres thanks to a 3.9 litre sub tank located low in the frame below the seat. A high pressure electric fuel pump with quick connect fittings provides fuel to the EFI system. Large 1.25″ diameter handlebars. All electrical wires are hidden inside the handle bars for that clean custom look. Selected meter functions can be controlled by buttons on the back of RHS switch gear.